Wow! Christmas is in less than a week. Where did the time go? My girls still have school this week, and that makes me realize that I still want to get gifts for their teachers. Today, I'll be mixing up some batches of Dipping Oil Spice Mix for their gifts. It's quick, easy and I usually have all the ingredients right in my pantry. It's the perfect gift to share for our last Make It Monday of 2011. Dipping Oil brings fond memories to my mind. Back in California, I had a weekly Girls' Night with a couple of friends. We'd gather to watch a tv show together, have a glass of wine and munch on something tasty. One of the things that we enjoyed on more than one occasion was french bread with a seasoned dipping oil. Oh, so yummy! While you can buy the mixes premade, you can also easily mix up a batch yourself. Here's the recipe that I use. Feel free to whip up a batch and test it out yourself. Add or subtract ingredients until you get it just the way you want it. If you're giving it as a gift, be sure to include a card or label that has instructions on how to use it. Mix all ingredients together in a blender until all spices are similar in size. (I like to use my Magic Bullet.) 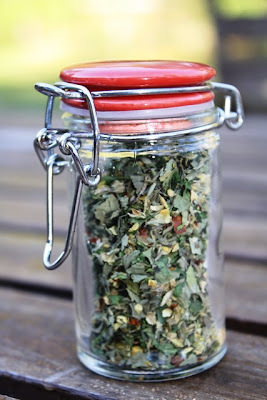 Store spice mix in an airtight container. To use, combine 1 teaspoon of mix with 3-4 Tablespoons olive oil, or to taste. Allow to sit for a few minutes. Use as a dipping oil for bread. For other homemade gift ideas, visit the Make It Monday archive. Recent additions to the archive include Paper Bead Necklaces, Satin Floral Hairclips and Homemade Dog Treats. This makes a great appetizer at New Year's Eve -- just add the oil and some good bread. For other New Year's recipes, check out Life as MOM's Ultimate Recipe Swap.